The word “Movember” is derived from the combination of the word “mo”, which is the Australian-English abbreviated form for “mustache” and “November”, as the event takes place every year during the month of November. This involves growing of mustaches in order to raise awareness of different men’s health issues like prostate cancer, testicular cancer and mental health challenges. Using the moustache as a catalyst, Movember encourages men to invest in their own health by more openly talking about their health concerns and more proactively seeking necessary medical care. The idea is to bring about change and give men the opportunity and confidence to learn and talk about their health and take action when needed. Participants of Movember are called “Mo Bros”. 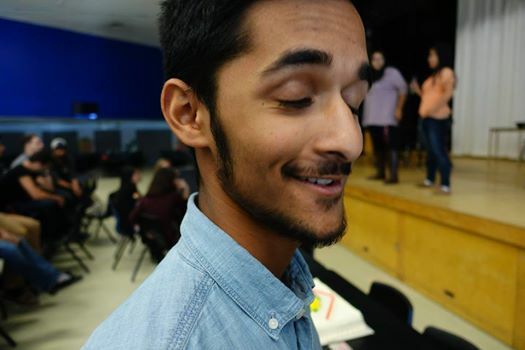 This year our son Nikhil decided to be a “Mo-Bro” at his high school and hence grew all facial hair for a month. At the end of it he decided not shave it off. The students did succeed in raising about the men’s health issues and also collect money during a charity event at the school. The women taking part in Movember are called “Mo Sistas”. Mo Sistas are not necessarily encouraged to grow mustaches of their own, but to support the cause, spread the word and encourage guys to become a walking billboard for the charity. The idea of Movember originated in 1999, when a group of men from Adelaide, Australia decided to grow their mustaches for charity during the month of November. Then the Movember foundation came into existence. The goal and motto of the foundation is to “change the face of men’s health.” The movement has gone global and today is well supported in New Zealand, the US, Canada, UK, Finland, Netherlands, Spain, South Africa and Ireland. From 30 Mo Bros in Melbourne, Australia in 2003 to 4 million Mo’s by 2013, Movember, through the power of the moustache, has become a truly global movement that is changing the face of men’s health. Some of the celebrities who have endorsed the Movember movement are Australian World Surfing Champion Mick Fanning, 2009 F1 World Champion Jenson Button, UFC Lightweight Champion Frankie Edgar, New Zealand’s national rugby captain Richie McCaw and US actor Nick Offerman who worked on a series of videos for the movement. Indian cricketers Ravindra Jadeja and Shikhar Dhawan, and Bollywood actor Ranveer Singh have been the prominent faces of the movement in India. The best part is that the shaving and razor supplier Schick, is one of the biggest partners of Movember. 1 in 6 men will be diagnosed with prostate cancer in his lifetime. Over 238,000 new cases of the disease will be diagnosed and almost 30,000 men will die of prostate cancer every year. Testicular cancer is the most common cancer in males between the ages of 15 and 35. Men who sit more than six hours a day have an 18 percent increased risk of dying from heart disease and a 7.8 percent increased chance of dying from diabetes compared with someone who sits for three hours or less a day. Globally, 5.3 million deaths will be attributed to physical inactivity. 24% of men are less likely to go to the doctor compared to women. A man spends an average of five months of his life shaving if he starts at the age of 14 — assuming that he lives until he’s 75 years old. In a deck of cards the King of Hearts is the only king without a mustache. After a long gap I have been to this blog and I read this article. It’s quite interesting and informative. I wonder how my colonel uncle could write about every subject in a very elaborate and explanative manner. Really you are doing an awesome work uncle. Congrats..
thanxx rejiappa for this article…. actually none among us(boys in my college) know the actual intention of “No shave November” even though many are participating in it. Someone said its intention is to give the hair and mustache to the cancer patients. hihhihi…. anyway well said rejiappa and thanxx…. njan oru alakku alakkum….